This answer covers the case where you can’t hear speech from some/all voices on your system. In the Sounds drop down list select a sound and click the play button. If you can’t hear a sound you need to check your speakers are connected, the volume control is not set to zero or muted. If you still have the dialog open, look on the ‘Volume’ tab. There may also be some more settings if you click the ‘Advanced’ button. In the beginning, most domestic computers only had one sound output device and that is where the software sends the speech. Life now is more complex. You may attach USB or Bluetooth speakers, Skype or other headphones. Even some mobile phones can act as an audio output device. 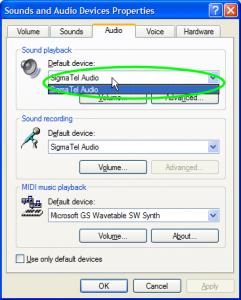 When you plug in a secondary output device, Windows will often route the audio to the new device. When it is removed, Windows removes the device but does not always reset the default device correctly. Windows maintains separate default output devices for audio and speech so you may lose some voices but still be able to hear music. The Acapela voices are sent to the default audio device which is configured on the ‘Audio’ tab. 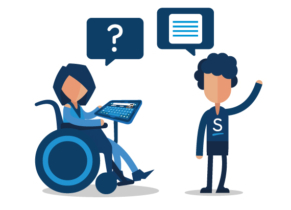 SAPI5 voices are managed through the ‘Voice’ tab. First, if you can get the machine on-line, run Sensory Update. Although this will not fix all problems with the Acapela voices, it will check the rest of your software. If you cant get the machine on-line, phone the office for a new set of CDs and try re-installing the software. If you are having problems with some voices not working, it may be related to licensing issues. Run licence manager and see if the voices are correctly licensed. Some third-party voices may be locked to specific products so you may see some SAPI5 voices listed that don’t work. You are welcome to experiment with these, but they are primarily intended for testing during a remote desktop session. Please phone support for advice. If possible have the machine on-line when you phone.